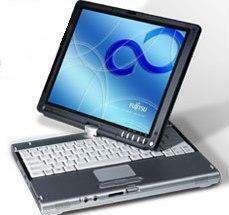 Fujitsu U810 - the palm-sized LifeBook(R) U810 mini convertible notebook. Weighing in at 1.56 pounds with a 5.6-inch LED backlit display, the world's smallest tablet convertible* is ideal for on-the-go work forces who need to run office applications and stay connected while on the road. And for down time, the bright 5.6" LED based screen is ideal for watching a movie, or just listening to your favorite tunes. An integrated camera also makes the LifeBook U810 notebook perfect for video conferencing and digital picture taking. With the power to run all standard notebook applications, the LifeBook U810 convertible works as a traditional notebook with an ultra-slim QWERTY keyboard, or by swiveling the WSVGA Crystal View illuminated screen, as a handheld Tablet PC with a touch screen for finger or pen input. Back at the office or at home, place the LifeBook U810 notebook into a docking station and attach an external display and keyboard for a true desktop experience. The LifeBook U810 notebook, which complies with the new Energy Star(R) version 4.0 guidelines, is equipped with the energy-efficient Ultra Low Power Intel(R) A110 processor optimized specifically for highly mobile devices. With a standard four-cell battery, it delivers up to 5.5 hours(1) of computing time, perfect for a cross-country flight. The LifeBook U810 notebook offers a choice of operating systems, including Windows Vista(R) Home Premium, Windows Vista(R) Business or Windows(R) XP Tablet PC Edition 2005. "The LifeBook U810 convertible has a familiar form factor and all the power of a standard notebook in a 1.5 pound package. It is one of the only products to provide notebook and tablet functionality in this class," said Paul Moore, senior director of mobile product marketing, Fujitsu Computer Systems. "Mobile professionals and consumers who desire the ultimate in mobility shouldn't settle for devices that provide only limited functionality when they can have a fully functioning laptop with the LifeBook U810 convertible notebook." The LifeBook U810 notebook is packed with a suite of advanced security features to safeguard information, including Trusted Platform Module support and two-level BIO lock, along with a fingerprint sensor for encrypting sensitive files with a finger swipe. The LifeBook U810 also features an SD Card reader and CF slot. An optional docking station is also available for those who wish to use the U810 as a desktop replacement. The LifeBook U810 notebook, priced starting at $999(2) is immediately available through the Fujitsu direct sales force, website, channel partners and select retail outlets(3). Users can choose from a recommended configuration, or they can customize their system using the Fujitsu Configure To Order (CTO) program. See http://www.computers.us.fujitsu.com/store/index.shtml for further information. The LifeBook U810 notebook is backed by a one- or three-year International Limited Warranty for U.S. and Canadian customers. The International Limited Warranty(4) includes technical support 24 hours a day, seven days a week(5), and unlimited online chat support. In addition, Fujitsu offers other warranty plans designed to meet the unique needs of mobile users. See http://us.fujitsu.com/computers for further information. Fujitsu, the Fujitsu logo, LifeBook and TRIOLE are trademarks or registered trademarks of Fujitsu Limited in the United States and other countries. Intel, the Intel logo and Intel Core are trademarks or registered trademarks of Intel Corporation or its subsidiaries in the United States and other countries. Microsoft, Windows, and Windows Vista are trademarks or registered trademarks of Microsoft Corporation in the United States and/or other countries. ENERGY STAR is a registered trademark of the United States Environmental Protection Agency in the United States. All other trademarks and product names are the property of their respective owners. (1) Battery life estimates reflect the results of BAPCo MobileMark2005 Productivity Workloads performed upon systems with battery life setting enabled on Windows(R) XP operating systems. Actual battery life will vary based on screen brightness, applications used, features selected, power management settings, battery conditioning, and other customer preferences. DVD/CD-RW, DVD Writer, LAN, wireless LAN or hard drive usage may also have a significant impact on battery life. (2) Pricing may change without notice. (3) Certain retailers will only offer select models. (4) Subject to International Limited Warranty terms and conditions. (5) Service and warranty repairs turnaround time may vary by country and product. Support 24 hours a day, seven days a week applies to the U.S. and Canada only. Subject to International Limited Warranty terms and conditions. I saw this unit in person at the Microsoft Worldwide Partners' Conference in Denver. I immediately decided I wanted one. The LifeBook U1010 features a 0.3 Mega Pixel integrated camera for easy communication with contacts and digital picture-taking. It truly epitomizes the idea of an all-capable ultra-mobile companion. The LifeBook U1010 features a 5.6-inch SuperFine WSVGA display to offer you the best clarity and impact for portable entertainment, while being compact enough so you can carry it around easily. With advanced security features such as BIOS Lock and Fingerprint Sensor, your confidential data is assured against intrusion by unauthorised parties. For a full list of accessories, visit www.shopfujitsu.com or call 1-800-FUJITSU. Warranty7 One- or three-year International Limited Warranty on select corporate configurations; 24/7 technical support; Fujitsu extended service plans available. Accessible capacity may be less, due to formatting, applications and backup utilities. The internal modems on all mobile computers from Fujitsu notebooks of Fujitsu Computer Systems are only qualified for use with telephone systems in selected countries, including the United States and Canada. For a list of certified countries, please check http://www.computers.us.fujitsu.com/modems. Actual speeds over U.S. telephone lines vary, and are less than 56K due to current FCC regulations and line conditions. Requires optional Smart Card Holder in order to access the reader. Third-party Smart Card and application required. Requires Computrace or LoJack for Laptops service. Battery life estimates reflect the results of BAPCo MobileMark2002 Productivity Workloads performed upon systems with battery life setting enabled. Actual battery life will vary based on screen brightness, applications used, features selected, power management settings, battery conditioning, and other customer preferences. DVD/CD-RW, DVD Writer, LAN, wireless LAN or hard drive usage may also have a significant impact on battery life. If you're interested in the Fujitsu slate models, click here for more information. Note 1: Microsoft® Office OneNote® 2003 requires product activation. Intel® Graphics Media Accelerator 950; Dynamic Video Memory Technology (DVMT) responds to application requirements and efficiently allocates the proper amount of system memory (up to 224 MB) for optimal graphics and system performance. Atheros Super AG® Wireless LAN (802.11a/b/g); Wi-Fi® certified; dual antennas. Warranty7 One-or three-year International Limited Warranty on select corporate configurations; 24/7 technical support; Fujitsu extended service plans available. Preinstalled with a free 90-day trial version of Symantec Norton Internet Security 2006. The 90-day trial version is activated upon user’s acceptance of software license agreement. After 90 days, the user must purchase a subscription from Symantec to download latest virus definitions. To utilize hard drive protection using ShockSensor, please install the application from the ShockSensor CD that comes with the system. Accessible capacity may be less due to formatting, applications, and backup utilities. The internal modems on all Fujitsu notebooks from Fujitsu Computer Systems Corporation are only qualified for use with telephone systems in selected countries, including the United States and Canada. For a list of certified countries, please check http://www.computers.us.fujitsu.com/modems. Actual speeds over U.S. telephone lines vary, and are less than 56Kbps due to the current FCC regulations and line conditions. The internal modems on all Fujitsu Tablet PCs from Fujitsu Computer Systems Corporation are only qualified for use with telephone systems in selected countries, including the United States and Canada. For a list of certified countries, please check http://www.computers.us.fujitsu.com/modems. Take this convertible for a ride—put the top down and use digital ink to take unobtrusive hand-written notes and draw diagrams during meetings and seminars, or write directly onto slides for emphasis during your presentation. Put the top up when you use your notes, drawings, and annotated graphics in a formal report. The LifeBook® T4000 Tablet PC provides the full power, functionality, and familiarity of a notebook yet offers versatile digital inking capabilities. The optional wide viewing-angle display means you get a bright, clear display at almost any angle while the integrated wireless LAN technology allows you to stay connected when running from meeting to meeting and back to your desk. Take advantage of the new modular bay to install a second battery for the longest of workdays. Or install a modular optical drive to watch movies on DVD, listen to music CDs, and store data. The optical drive features the T4000-exclusive patent pending BayLock™ feature which protects the optical drive when the system is in Tablet mode. The LifeBook T4000 combines the familiarity of a traditional notebook with the versatility of a Tablet PC.The modular bay will accommodate a second battery to extend your workday, a media drive or a weight saver for the lightest possible configuration. The built-in Intel® Centrino™ Mobile Technology gives you instant wireless access whenever you need it. The LifeBook T4000D Tablet PC delivers all the performance and innovation of the LifeBook T4000 notebook with Atheros Super AG™ (802.11a+b/g) wireless LAN technology. This new wireless standard offers transfer rates of up to 108 Mbps (nearly 10x faster than the 802.11b standard). The modular bay will accommodate a second battery to extend your workday, a media drive or a weight saver for the lightest possible configuration.